Never leave suits out to dry in the sun. Overexposure to sunlight can damage the fabric or fade the suit. Adjustable straps around neck and back for a better fit. No underwire and soft cups shape give top primely support & gathers your breast. Ruffles adorns the belly and each side of the high waist bikini bottom, providing tummy control while creating a slim waistline. Classic modest 50s high-waisted two pieces design, suit for sunshine, beach, pool party and all your leisure time. Care Instructions: Hand wash, hang to dry, no iron, no bleach. 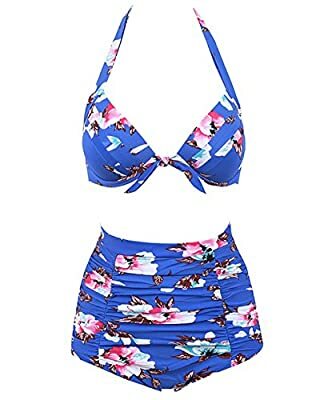 Package Includes: Two piece high waisted bathing suit (top & bottom).